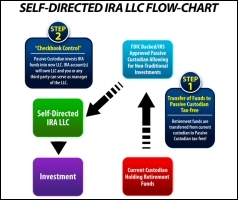 How Does a Self Directed IRA LLC Work? With a Self-Directed IRA LLC with “checkbook control” you no longer have to pay excessive custodian fees based on account value and transaction fees. Instead, with a “checkbook control” Self-Directed IRA LLC, an FDIC backed IRS approved passive custodian is used. By using a Self-Directed IRA LLC with “checkbook control” you can take advantage of all the benefits of self-directing your retirement assets without incurring excessive custodian fees and custodian created delays.